Bethlehem is a Palestinian city on the West Bank. 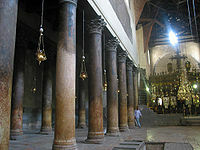 It is most famous as the place where Jesus was born. (See Gospel of Matthew chapter 2.) It is five miles from Jerusalem in Israel.